What Does an Embouchure Do? Today I will discuss embouchure. Virtually every wind instrument music teacher uses the word, and teaches students how to form and use one. Yet embouchure can easily become one in a list of things the student must do to produce a pleasing sound on a musical instrument. When difficulties arise, or when obstacles (such as dental braces) are introduced, teachers and students alike can be at a loss as to what to do, because the concept of what an embouchure is and what it does has been overlooked. As is often the case, beginning with the word itself can be helpful in understanding what the word means, and how the thing it represents can be used. The word embouchure is French derived from the verb embouchure meaning to put to one’s mouth. The word contains bouche, which in English means mouth. A suitable definition of embouchure is found in wordreference.com: “the correct application of the lips and tongue in playing a wind instrument.” The term “wind instrument” refers to both brass and woodwind instruments. 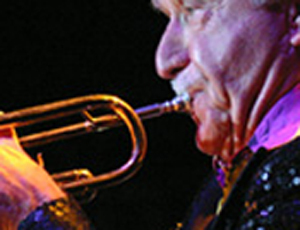 Regardless of the details of playing each kind of instrument, there is one thing all embouchures must do: An embouchure must firmly hold or grasp the material attached to the vibrating element so that the vibrating element can vibrate freely while having the right amount of control placed on it to produce the characteristic sound of the instrument being played. For brass instruments, the embouchure firmly holds the corners of the mouth and lips so that the center of the lips can freely vibrate, yet still be under control so that poor tone and blasting is avoided. In this respect, one part of the mouth is serving as the embouchure, while another part of the mouth is serving as the vibrating element. When the mouthpiece is applied, it contacts the lips on the embouchure, but must not be delegated the task of doing the job of the embouchure, that is, of holding the vibrating portion of the lips. Such an arrangement leaves the vibrating portion of the lips at liberty to vibrate freely, unimpeded by the presence of the mouthpiece. When the embouchure is so employed, the need for mouthpiece pressure is at least nearly eliminated, and the impact of braces is reduced, if not eliminated. The other part of the embouchure (frequently overlooked) is the tongue. It adds to the work of the embouchure portion of the lips by directing air flow in side the mouth, and varying the size of the passage between the tongue and the roof of the mouth through which air must flow to reach the vibrating element. When the tongue is raised, the passageway is made smaller causing the air to flow faster in support of higher pitches. When the tongue is lowered, the passageway is made smaller causing the air to flow slower in support of lower pitches. Much of this happens rather naturally, and can be over controlled, causing tension in the throat. The throat must remain open and relaxed so that airflow is not restricted out of the lungs. 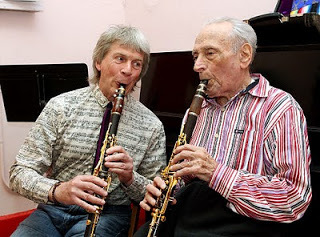 Richard Stoltzman and Kalmen Opperman playing clarinet with French embouchures. For reed instruments, the lips are employed only in holding the vibrating element; they are in no way employed as the sound source. The lip is minimally curled over the lower teeth for single reed instruments and over top and lower teeth for double reed instruments. The French embouchure for clarinet, which I strongly prefer, also curls the top lip over the top teeth, with the top lip firmly placed on the top of the clarinet mouthpiece. Because the lips are directly contacting the reed, the point of contact on the reed is where all vibration stops, and where the embouchure begins. For this reason, the embouchure should be placed on the reed as far back on the reed as possible to maximize the length of reed that is free to vibrate. Remember that the further back the embouchure is placed, the firmer it must be to hold the reed, because all reeds become thicker moving away from the tip. The point at which all pitches can be played with a full and characteristic tone without need of moving or adjusting the embouchure is the correct placement. Understanding the how as well as the what of wind instrument embouchures is key in forming and using a proper embouchure, and in correctly responding to obstacles and problems that inevitably crop up over time for every wind player. It is important to remember that the embouchure is used to hold the vibrating element with the lips, and direct the airflow through the mouth with the tongue. The later purpose is why articulation is properly done with the end of the tongue, leaving the rest of the tongue to funnel the airstream. 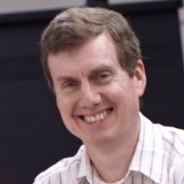 When formed and used properly, an embouchure results in a characteristic tone evenly distributed across the entire range of the instrument with little to no adjustment.